I always start out these posts with a disclaimer on how long I have been paying attention to this clown. 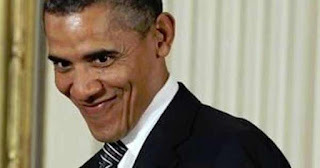 My first post that I can recall about Barry Obama was in October of 2005 when I was writing posts on exactly how corrupt and incompetent that Democrat Senators were at the time. I also read Dreams from my Father, Barry's book that foretold how much of a racist, Communist moron that this guy is. Please remember, in The Ago, I was not trying to live my life in a Christ-like manner. I used language that should not be used in polite company. At this point in our nation's history, maybe being polite can suffer a tad while we try to concern ourselves with saving the Greatest Country in the History of the World from Democrats and their imbecilic voter base. Yes, in case you did not know, Democrats are evil people and should not be regarded when making any decision that affects mankind. All criminals are NOT Democrats, but ALL Democrats are criminals. It is even in their party platform to kill babies whenever and wherever Democrat women want to kill babies. Since they want to kill all of their babies, they have to find votes in some other place. But, on any issue, you can rest assured that if Democrats are for it, the RIGHT position is to be against it. Anyhoo, back to Barry Obama's race wars and his wars on the police. Most people do not know about or remember Barry's first HUGE public announcement about how much he hates police officers, but I am going to remind everyone. There exists a little scumbag named Skip Gates that serves as the Alphonse Fletcher University Professor and Director of the Hutchins Center for African and African American Research at Harvard University. Please pay attention to the title and the feigned importance listed. Skip Gates is a race hustler. What happened is "Professor" Gates came home from a trip to China to "research" Yo-Yo Ma (true story) to his (Harvard owned) house in a gated community in Cambridge, Mass and found himself locked out. He broke in and one of the neighbors called police. If Skip would have simply shown the police his credentials and used a minimum of polite decorum, all would have been well. Skip flipped out claiming racism and whatnot. He got arrested. Of course the charges were eventually dropped because Skip Gates apologized for being a racist moron. The police officer did NOT apologize because he was IN THE RIGHT. But, Barry Obama inserted himself into the event because his whole life is about how Barry can benefit and manipulate really stupid people. He said, "The police acted stupidly." The only way that I can conclude that Barry defines "stupid" is if he doesn't understand it. To list the things that Barry Obama doesn't understand would require doubling the number of characters on the internet, so I'll abstain. AT. THIS. TIME. And then came Trayvon. In an area that had 402 calls to police in a year (remember Democrats, there are only 365 days in a year), the neighborhood set up a watch program to help combat the increasing number of Democrat sightings. When a man working the neighborhood watch encountered Trayvon, he followed him to find out what was up. Trayvon attacked this watchman and wound up dead from a gunshot when the watchman decided HE was in danger of being killed. Stupidity ensued. Hoodie donning exploded. Profiling became a bad thing, because an old Jewish Indian Native American Indigenous grandmother (But she was probably WHITE!) could have been breaking into those houses! Because you know, support criminals and stuff. Fast forward to today. Black Lives Matter has sent representatives to the Barry White House to talk about what exactly? Policemen are getting murdered at an alarming pace. BLM is standing in the middle of our streets and highways, because WHY? Because Democrats NEED a victim class, people. AND! It has always been the black folks. In an era when anyone with an IQ over forty votes for Republicans, Democrats have to literally BREED more stupid people. If they cannot be bred, then they have to be created through hatred and a need for free stuff. And those victims have to have an oppressor. The police work out as a very good scapegoat, because statistics can be manipulated in such a way as to give stupid people "evidence" for their grievances. Here are the FACTS, not Democrat facts, but literal, actual facts. In 2011, the last year that full accurate statistics are available, there were 72 felonious deaths of police officers. That accounts for a death rate of 0.00008% of ALL police officers are killed in the line of duty. That is horrible, but their job is to round up Democrats that break the law. In the same time frame, 166 people were killed by police. Let's just assume every last one of those 166 killed were Black for the sake of argument. Using the number of ALL black folks in the US, 74.5 MILLION, skewing the police killed as all Black, we come to a ratio of somewhere in the range of 0.0000000222 percent of blacks are killed by police. Huh?!?!?! Police are killed more frequently that black folks! Now, since the overwhelming majority of crime is perpetrated by black men (eleven times higher! ), and almost ALL murders are by black men (seven times higher! ), let's back the black chicks out of the numbers. Since women ALWAYS make up more of the population, so NOT A MINORITY!, let's cut the number in half. 37.25 million. That brings our ratio to 0.000000045 percent of black men are killed by police. So, class, judging by MATH and FACTS, police should be the ones that are blocking highways and going to the Barry White House to foster a conversation on why police are getting murdered at such a high rate. Barry will never invite them because they would only net the Democrat Party about one million votes if every one of them voted for the Democrats. That would never happen. The moral of this story is, "Do not listen to Democrats, they are dangerously stupid and would actually die out if evolution was true."